The Coalition of Aggrieved Customers of defunct Menzgold Ghana Limited is fuming for the delay in the settlement of their locked up funds which has led to some of their members losing their lives. Funds of the customers are locked up with the defunct firm following its closure by the Security and Exchange Commission (SEC) in 2018. Whiles they continue to pile pressure on government and the authorities involved to help retrieve their money, it appears the degree of their suffering has extended to another level. According to the aggrieved customers, 15 of their members have died as a result of their inability to retrieve their monies from the troubled firm to cater for daily needs of their family. This was revealed on Tuesday, April 2, 2019, when the aggrieved customers took to the streets to picket. 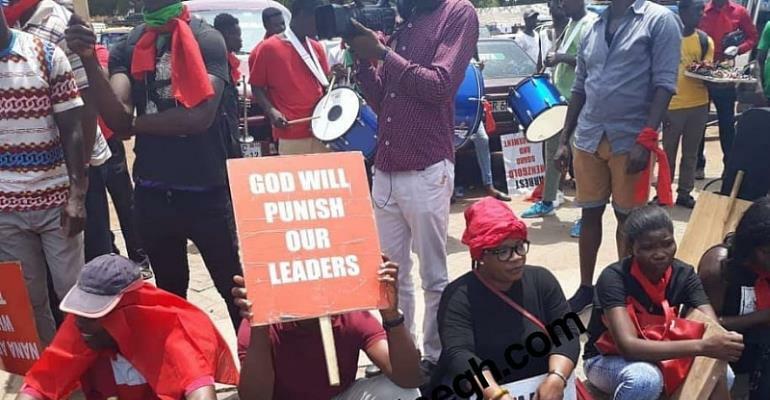 The demonstration is expected to last 5 days and whiles they commenced yesterday at the head office of the Economic and Organized Crime Office (EOCO), it is believed that they will hit the streets again today Tuesday April 3. Speaking to Hot 93.9FM’s on the sidelines of the demonstration yesterday, the Public Relations Officer (PRO) of the aggrieved Customers, Baffour Tawiah shockingly revealed that they will not take their baths until they complete the 5 days picketing at the EOCO office. “We have started our 5 days picketing at the EOCO Office today…the police are trying to frustrate us but it’s ongoing because we can’t hold it anymore…our people are dying through stroke, heartbreaks etc. So far 15 of our members are dead. With the timeline given, the aggrieved customers will end their 5-day demonstration at the premises of EOCO on Saturday, 6th April 2019.